At 8:58pm Clinton made her way to the stage through the crowd of hundreds who packed the huge ballroom and had waited hours to see her. In a 15 minute speech, she laid out her plans if elected president in November, citing the need for more affordable child care, equal pay and standing up for the middle class. But it wasn’t long before she tore into GOP rival Donald Trump. “When we hear a candidate for president call for rounding up 12 million immigrants, banning all Muslims from entering the United States, when he embraces torture, that doesn’t make him strong, it makes him wrong,” she told the crowd. “We need a commander-in-chief that will defend us, not embarrass us!” she quipped. The crowd went wild. She encouraged them to stand against discrimination. Instead of bigotry, she pointed out, Clinton said the next president of the United States needs to be ready to put forth positive initiatives, keep Americans safe and bring the country together again. “Americans are looking for solutions,” she shouted with a hoarse voice. She also encouraged the crowd to stand with President Barack Obama when he nominates a Supreme Court Justice. He did so the following day. Her decisive win in Florida on Tuesday left her on track to expand her large lead over her opponent Bernie Sanders. After Tuesday’s victories, Clinton has over 1500 delegates while Sanders trails far behind with 800. 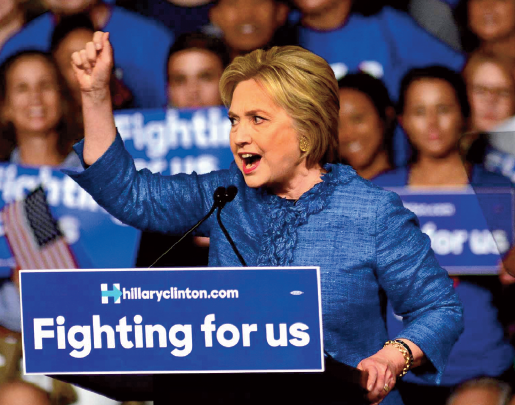 Her victories in four key primaries Tuesday has all but solidified her hold on the Democratic nomination. Her supporters are now unifying with her to take on the GOP nominee, who might likely be Donald Trump. Maureena Parilla of Boca Raton was upset, however, because security and Secret Service wouldn’t let her into the rally. She and a small crowd were relegated to standing behind a perimeter just outside the hall’s entrance. Security cited the capacity crowd and said it was a fire hazard to allow more folks into the hall. “I drove from Boca to get here. I love her. This is ridiculous and outrageous that they won’t let me in!” But in the end, Parilla was able to see and hear Clinton from the perimeter. She was pleased. “I’m a huge supporter of Hillary because she’ll get the job done!” she said. After Tuesday’s contests, the race shifts to contests in Arizona, Idaho and Utah on March 22 and Alaska, Hawaii and Washington state on March 26.